Secrets of Eternity, known as The Secret of Evolution (ザ・シークレット・オブ・エボリューション Za Shīkuretto obu Eboryūshon) in the OCG, is a Booster Pack in the Yu-Gi-Oh! Official Card Game (OCG) and Yu-Gi-Oh! Trading Card Game (TCG). It is the third set in the OCG's 9th series, following The New Challengers, and followed by Crossed Souls. Contains members and/or support for the "Constellar", "Deskbot", "Dragunity", "Gem-Knight", "Jinzo", "Koa'ki Meiru", "Metaphys", "Monarch", "Morphtronic", "Nekroz", "Performapal", "Qli", "Shaddoll", "Ritual Beast", "Superheavy Samurai", "tellarknight", "Volcanic", "Wind-Up", "X-Saber", "Yosenju", "Charmer" and "Familiar-Possessed" archetypes. The OCG version contains members/support for the "Crystal Beast", "Number" and "Symphonic Warrior" archetypes. The TCG version contains members/support for the "Burning Abyss" and "U.A." archetypes. The Korean version contains a member for the "Old Entity" archetype. 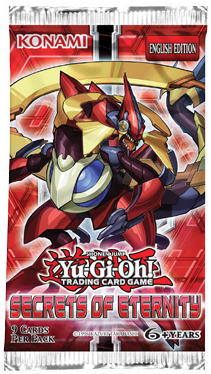 Introduces the "Infernoid" and "Raidraptor" archetypes to the OCG/TCG. Introduces the "Draconia", "Nekroz", "Ritual Beast" and "Yosenju" archetypes/series to the TCG.